Are you an Amazon Associate who owns a website that gets traffic from several different countries and you want to know how to monetize that traffic? The problem is that you might have visitors from other countries clicking on your Amazon affiliate links and you may not be earning commissions that you deserve. If your website gets a good amount of traffic from more than just your home/main country – then Amazon link localization is something that you DO NOT want to ignore. How Much Is It Costing You to NOT Localize Your Amazon Links? Have you checked your analytics lately to see how much of your traffic is coming from other countries? Did you even realize that you’ve likely been losing out on commissions when those visitors click on your Amazon affiliate links? If your foreign audience is substantial – we could be talking about a LOT of money you might be missing out on. This could be especially true if you have a non-U.S. site and you get substantial traffic from the U.S. because Amazon is so massive in the United States. But even if you have a U.S.-based site – Amazon commissions from other countries can really add up fast. Let me show you an example. Here is how it works… Let’s say you have an Australian-based website where you planned to target a mostly Australian audience and all of your Amazon affiliate links point to products on Amazon Australia (https://www.amazon.com.au/). For whatever reason – you start to attract a whole bunch of visitors from the United States. When those U.S. visitors click on your Amazon Australia affiliate links – they are unable to buy! Amazon DOES NOT automatically redirect them to Amazon.com (or any other country). That same product might not even be available in other countries. This is a huge problem and it could cost you thousands of dollars per month! It’s up to you to make sure the affiliate links on your site are localized so that you can earn commissions from all qualifying countries. Check your analytics. If you are getting significant amounts of traffic from other countries that have Amazon stores available – then you should be localizing your links. It’s really quite simple to do. You only need to spend a little bit of time setting it up once – then everything is done for you automatically after that. Have you heard of Darren Rowse and this little site that he runs called ProBlogger? Okay – that was a joke. 🙂 ProBlogger is HUGE and Darren has been around for a long time. Darren decided to test out Amazon’s native link localization tool called Amazon OneLink. Darren’s site is perfect to run a test like this since he has a massive worldwide audience with tons of traffic from many different countries. He published the details and results of his experiment with Amazon OneLink here. In a nutshell – Darren was able to capture just over $1,500 in EXTRA Amazon commissions, in just over a 3 month time period, that he would NOT have otherwise earned if he didn’t use link localization. This translates to an extra $6,000 per year (estimated)! In his blog post – Darren walks you through the setup process for Amazon OneLink and also discusses some of what he feels are the pros and cons. What is OneLink and how will it benefit me? Note: As of the time this was written (September 2018), only the countries listed above were actively working with Amazon OneLink. Please check with Amazon for an updated list. In a nutshell – all you have to do is sign up for Amazon Associates in any (or all) of the participating countries that you wish to have Amazon clicks redirected to. Then you place a script (code provided to you by Amazon) into the footer of your website and Amazon OneLink takes care of everything from there! Here is a step-by-step guide from Amazon Associates on the whole OneLink setup process. After that script is in place – you don’t need to do anything else. It automatically redirects all existing and all future text links and sends users to the proper Amazon store based on their country location. Although Amazon documentation says it only works for text links – it actually works with all of the links types that are available with AmaLinks Pro (text, image, CTA, Showcase). Note: Amazon OneLink DOES NOT work with Native Shopping Ads or other Amazon ad widgets. In much the same way as Amazon OneLink – Genius Link offers a simple script (piece of code) that you insert into your website and it automagically converts all of your existing and future links. To make things even easier – they offer a WordPress plugin that you can install if you’re not comfortable placing code on the back end of your site. We at AmaLinks Pro are big fans of Genius Link and it is what we use for link localization on our personal sites. We’ve tested it thoroughly and Genius Link works for converting ALL link types created by AmaLinks Pro. Note: Genius Link DOES NOT work with Native Shopping Ads or other Amazon ad widgets. Here is a really good FAQ page for Genius Link that should answer any additional questions you might have. While doing research on this topic – I’ve scoured the internet looking for information on link localization. By far – the best external write-up I’ve found for Genius Link is this Genius Link review by Harsh Agrawal on his Shout Me Loud blog. The ONLY downside to Genius Link vs Amazon OneLink is that it isn’t free. Although the cost is VERY reasonable at $2 per 1,000 clicks. This minimal cost can easily be justified when you realize that if you can’t earn an extra $2 from 1,000 clicks to localized links – then you probably shouldn’t be localizing your links at all! Genius Link is better – hands down! It’s not even close. If you just look at the fact that Genius Link works with ALL countries that have Amazon storefronts and Amazon OneLink only works with about half of those countries. But Genius Link is better for many more reasons as well. Take a look at this comparison chart posted on the Genius Link blog. Note: DO NOT use Amazon OneLink and Genius Link at the same time. They are not compatible with each other. That’s it! 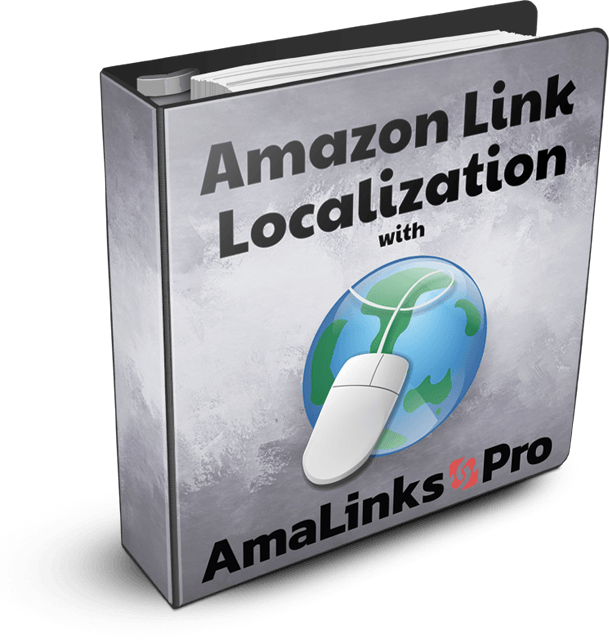 That’s all you have to do in order to localize ALL of your Amazon links using AmaLinks Pro. It doesn’t matter when you insert the code – the script will automagically convert ALL existing and future links and your site is instantly transformed into an international money-making machine! Note: There are sign-up and setup processes for both OneLink and Genius Link that will need to be completed. It’s not very hard but it may take a little bit of time. Link localization with these 2 solutions is extremely powerful and easier than it’s ever been to get setup. At AmaLinks Pro – we’re proud to partner with either of these solutions to make localizing your links as easy as possible! But that’s not the only thing that is WAY easier with AmaLinks Pro. Every single aspect of linking to products on Amazon as an affiliate is better and easier with AmaLinks Pro. What are you waiting for? Grab your copy today! So, the way that EasyAzon and AALB do their localization is through access to the Amazon API for each individual territory. (e.g USA, Canada, Europe, Australia) With Amazon’s new rules you can’t get access to the API until you’re a qualified seller. So if you want to be an affiliate you need to get qualified in each of the territories. Or you have to use Onelink, but that doesn’t support Australia [or several other countries] at this time. As far as we know, EasyAzon and several other plugins or tools that attempt to localize Amazon links still do it very much the old (manual) way. We highly recommend using either OneLink or Genius Link – which is why those are the ONLY 2 options that we support and recommend using in conjunction with AmaLinks Pro. Does AmaLinks Pro just need Amazon API access for the main locale that the user is using or do they need API access for all geographies? AmaLinks Pro ONLY needs API access for your main locale. The API access is only necessary to obtain product information within the plugin during the Post/Page editing process and also to display information on the Post/Page when it is live. Link localization does not take place until the moment a user clicks on one of the links. At that point – OneLink or Genius Link determines where the user is located and they send that link click to the most appropriate Amazon page. Yes. As explained above – link localization takes place only at the exact moment that a link is actually clicked. Link localization has nothing to do with the Amazon API for any of the respective territories. How are you dealing with Australia – if a user has access to the Australian API that would seem to work, but what about localization as Amazon AU isn’t on Onelink yet? You are correct – Amazon OneLink does not support Australia (at the time this is being written) – but Genius Link works with ALL territories! We highly suggest Genius Link over Amazon OneLink regardless of which country you are in – but especially for countries not yet supported by Amazon OneLink – Genius Link is an excellent alternative!